Ivaylo Atanasov writes for the website Baricada.org. He contributed to EURACTIV an English version of his article originally published in Bulgarian on 3 May, when the nominations for the third Borissov cabinet were unveiled. As the nominations for the third Borissov cabinet were unveiled, they sparked controversy on many accounts. But one name stands out – of the chairman of an NGO called the “Institute for Right-wing Policy” Neno Dimov. Former Deputy Minister in Ivan Kostov’s cabinet, MP from DSB (Democrats for a Strong Bulgaria, Kostov’s conservative party), speaker at the first libertarian events in the country, member of the board of directors of a state-owned enterprise, distinguished conservative, now promoted as a minister by the nationalists – Dimov is the embodiment of the essence of the new Bulgarian government. Last year he also became the head of the Bulgarian chapter of the World League for Freedom and Democracy (WLFD), an organisation previously known as the World Anti-Communist League. It has often been accused of having Nazi and neo-Nazi associations. In his first interview as the leader of the league in question, Dimov explained that his goal is to tackle the few “instruments, which stifle free enterprise and individual freedom – political correctness, left multiculturalism, green environmentalism”. Ironically, this active campaigner against “green extremism” is to become very soon the minister for… the environment. This should disturb not only environmental activists, but also the the diminishing Bulgarian scientific community and eventually all people who will find the anti-scientific views of the future minister, as described below, unacceptable. Dimov holds a Ph.D. in physics from the Bulgarian Academy of Sciences and is a lecturer at the Sofia University, but at the same time rejects the scientific consensus on climate change. He describes it as a “manipulation” from people that want to control the economy with regulation on free enterprise and budgets for environmental protection, and argues that to Angela Merkel and François Hollande climate change is merely “an inexhaustible source of fear” to distract from their failed policies. In 2012 the minister who will be responsible for environmental protection published a book, which serves to “justify the need for ever more serious restrictions of the role of the state in managing the environment and in general” in which he advocates for “freedom” as opposed to “environmentalism”. The book was published by “MaK”, to whom we owe a significant portion of the vast libertarian literature in Bulgarian. “So far there are no indications that the sea level has risen even by a millimeter” – Dimov explains in an interview for the YouTube channel of the Institute for Free Capitalism “Atlas”. He cites The International Panel on Climate Change at the UN, which actually begs to differ, and points out that since 1993 sea level has been rising at an alarming rate of 3 mm per year – significantly faster than in the last half a century. His geography knowledge fails him, as he doesn’t mention that the vast majority of ice on Earth is located at the South Pole, where there happens to be a whole continent. Besides Antarctica, the Ph.D. in physics from BAS also fails to notice the expected thermal expansion of the oceans as a result of warming and decreased density and suggest that Greenland is not an issue because it used to be “green” a few centuries ago as its name points out. Nevertheless, Dimov doesn’t think we can speak of warming at all: “Statistics show that in Eastern and Central Europe temperatures in the period 2001-2006 have been just the same as in 1920-1940, i.e. we can rather speak of some sort of cyclicality”, based on solar activity. But neither the data for the solar activity correlate with those for the temperature of the planet, nor is there any hint of “cyclicality” in NASA’s statistics. The more we delve into the logic of the minister’s exposé, the more strange assertions we uncover. The reason for this can most likely be found in the inappropriate context, in which we are looking at them – according to the “MaK” publishing house “the original, at times provocative logic of Neno Dimov can be best understood if placed in the context of his being a scientist, politician, statesman and public figure”. Thus, environmental protection and the right to a healthy environment of future generations unsurprisingly become the “new socialism”, because they imply regulation and restrictions on free private enterprise and try to deal with problems in view of the future that lies at least two or three decades ahead of us, not as they “arise in the moment”. These are Dimov’s reasons to speak of “green extremism” and place it alongside other dangerous movements such as “left multiculturalism”. According to him liberals shouldn’t be deemed right-wing – this was a leftover reflex from the 1990s when they joined the anti-communist movement only because “communism didn’t allow them to impose their form of terror, this mild form they have imposed in Western Europe”. In its turn the soft form of terror being waged on Western Europe supposedly is leading the EU to dissolution: “While the lefties and liberals are in power in the Commission, the Parliament and the Court, while conservatives and nationalists are on the outside looking in, the EU will always face an existential threat”, he explains. If you accept this premise, it is only logical to conclude that “mainstream parties have to incorporate the nationalists into the rule of the state” and in this sense the most pro-European course would be to include the Eurosceptics in the government, which is set to preside over the EU next year. 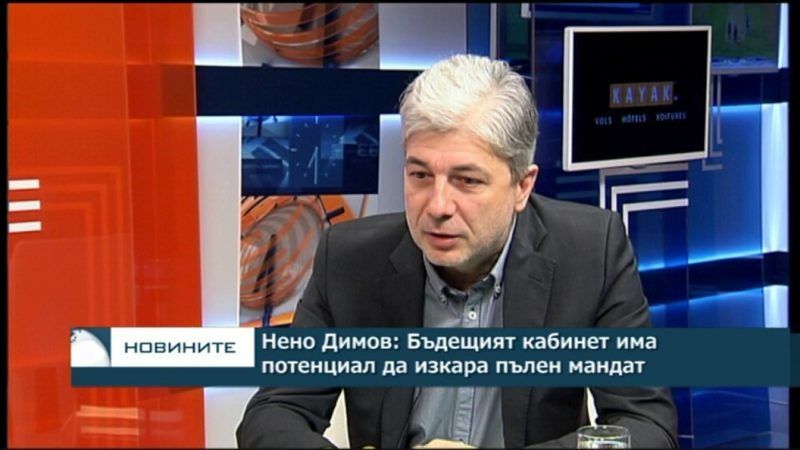 Indeed, Neno Dimov is the ultimate embodiment of the whole logic of the third Borissov cabinet. So beware green extremists and left-liberal terrorists, for libertarian-conservative nationalism is out to save Europe.